National Dropout Prevention Center National Dropout Prevention Center – The mission of the National Dropout Prevention Center/Network is to increase graduation rates through research and evidence-based solutions. Purchase sets of books for a faculty book study or PLC on an effective strategy. Create a dropout prevention reading room in your faculty lounge or school library. Give dropout prevention books to teachers and have a “Best Idea Shared” contest each month. Give dropout prevention books as faculty meeting door prizes. End the school year with a gift of summer reading in dropout prevention for your teachers. Greet next year’s new teachers with a gift – a book on dropout prevention strategies. Visit the NDPC store to shop this fantastic spring publication sale! 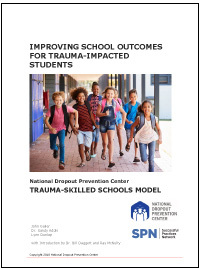 The National Dropout Prevention Center releases new publication, Improving School Outcomes For Trauma-Impacted Students with Introduction by Dr. Bill Daggett and Ray McNulty. Learn about the National Dropout Prevention Center Trauma-Skilled Schools Model and contact the National Dropout Prevention Center for assistance. Access the video of National Dropout Prevention Center Director Dr. Sandy Addis testifying to the South Carolina House Education Committee on School Climate and Safety. The National Dropout Prevention Center (NDPC), announces the Trauma-Skilled Specialist Certification program. This programs addresses the growing need for educators to adopt specific action steps that will increase the opportunities for trauma-impacted and stressed students to succeed and graduate. Video : Dr. Sandy Addis present the Trauma-Skilled Schools Schools Model presented to the SC House Education Committee on School Climate and Safety. Solutions to the Dropout Crisis covers a variety of topics related to dropout prevention efforts. The National Dropout Prevention Center offers a variety of cost-effective project components and supports that can be written into grants to strengthen your proposal, increase the likelihood of project success, and achieve long-term sustainability beyond grant funding. Review our list of grant project components or contact the National Dropout Prevention Center for assistance. The National Dropout Prevention Center's (NDPC's) Model Programs Database provides proven interventions for replication and inclusion in dropout prevention and school improvement grants. Proposals that replicate NDPC Model Programs are competitive and have high likelihood of achieving desired student outcomes. Visit the Model Programs Database or contact the National Dropout Prevention Center for assistance. Several large longitudinal studies include questions asked of high school dropouts related to reasons for dropping out of school. See some of the most frequent reasons reported over the last several decades in this NDPC article. "Why Do Students Drop Out?" Join the growing number of practitioners who are Certified National Dropout Prevention Specialists by enrolling in the National Dropout Prevention Specialist (NDPS) Certification Program for educators and at-risk youth workers. Certified Dropout Prevention Specialists complete a professional learning program founded in the Center's 15 Effective Dropout Prevention Strategies, document their experience by completion of a job-embedded field project, and serve as a national resource for others who work with at-risk youth. 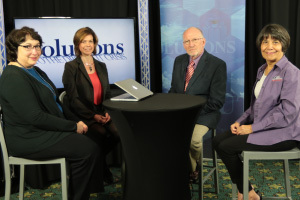 Click here to meet the Certified Dropout Prevention Specialists, to learn from their work, and to access their Field Project Report.